Use the basic ingredients that complement the meats flavours are onions, carrots and celery. And use the following ratio 2 onions : 1 carrot : 1 celery. Another rule is to slow cook it and not to boil the liquid. Remove any scum that rises to the top. For 1 kg of soup bones use 2 litres of water. Use a long and deep pot for simmering. 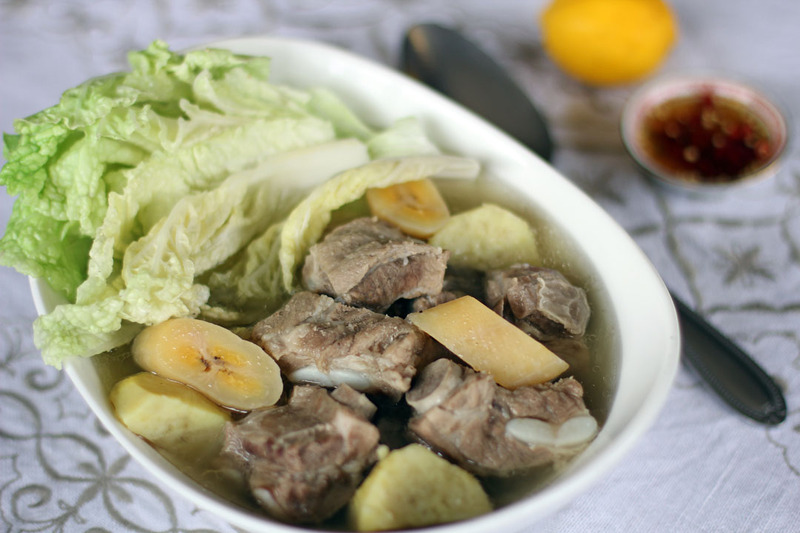 I guess it’s not just Philippines who have this dish, it’s so basic it can be existing in other cuisines as well such as Sup Daging in Malaysia, Cozido in Spain and Coddle in Ireland but for this post it will be the Filipino version so it will use some of our native ingredients. In a deep pot add pork bones, onions, celery stalk, carrots, peppercorns, salt and enough water to cover everything. Bring to near boiling point and when scum rises skim it off. Simmer for 3 hrs. in low heat. Add pork riblets and simmer for additional 30 minutes. Now separate pork riblets then set aside. Strain the liquid using a fine strainer and place it on a separate pot. Bring the stock to a boil, once boiling bring heat to medium-high and continue to boil for 15 minutes until reduced. Add pork riblet and plantain bananas. Simmer in low heat for 15 minutes. Add the sweet potatoes then simmer for additional 15 minutes. 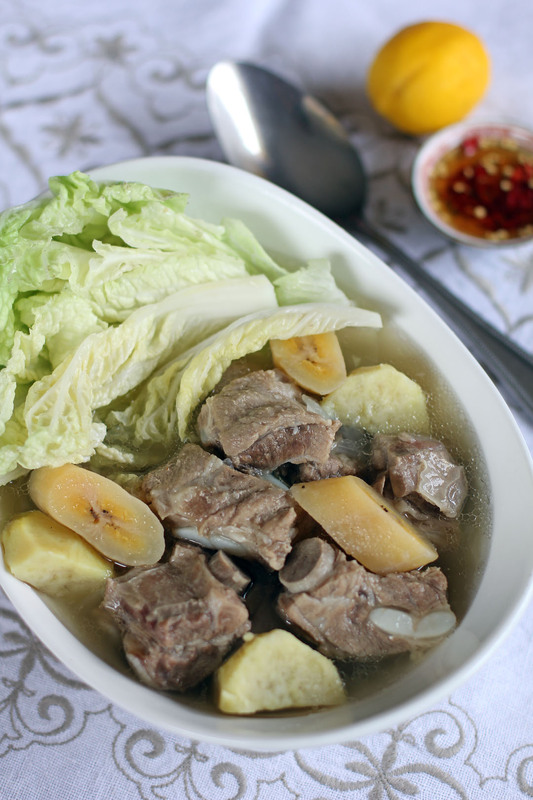 Turn of the heat, add Chinese cabbage cover and season with fish sauce (according to your liking), cover the pot for 5 minutes to cook the vegetable. This reminds me a lot of the meat, potatoes and carrots dish my mom used to make. Obviously different ingredients, but the same kind of look and feel to it. This really looks terrific! I’ve done something similar with beef, but never pork. Love the idea! Thanks for this.